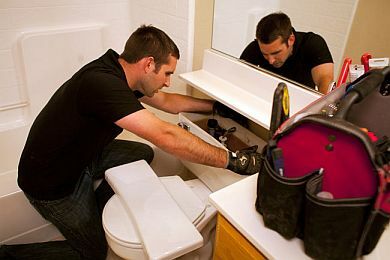 Our plumbing team excels at helping homeowners through plumbing crises! Our Martinez plumbing team has been working to help the local residents and businesses of our community for years. With top notch customer service, a wide selection of professional equipment, and a crew of certified and licensed plumbers behind us, we are confident that we can tackle any and all of your plumbing problems. Whether it's an emergency leak or a toilet that won't stop backing up, we are the plumbers you should call first - not just next time, but every time. We don't just fix clogged toilets or shower drains - we perform a full array of plumbing services that will help keep your home or business space functioning properly. Don't let the stress of a broken water heater or backed up drain ruin your day. Instead, call our Martinez plumbers and let us handle the annoying stuff so you can get back to what really matters. Don't fall into the trap of letting someone perform plumbing repairs that are “good enough” but not permanent. Let our Martinez plumbing team provide you with the best plumbing repairs at a price that won't break your bank. You won't regret it. If you've dealt with plumbers before, you'll know that great customer service often gets put on the back burner. That's not true with our plumbers in Martinez. We make sure that every team member knows that customer services is our priority at all times - not just when it matters most. We talk to you openly and honestly, giving you realistic advice on how to approach your plumbing repairs. We'll discuss budget, estimated completion time, possible alternatives, and more in order to ensure that you understand what is happening at every step of the way.